The seafood landed in Salcombe is renowned by top chefs to be some of the very best in the world. Of particular note is the lobster and of course delicious Salcombe crab. Why not treat yourself to lobster thermidor in The Kings Arms or Jetty restaurant in the Salcombe Harbour Hotel? Crab is simply wonderful in a sandwich with lashings of mayonnaise – mmmmm! The fact that Salcombe has its own ice-cream factory means you simply have to try it whilst in Salcombe! And it is totally blimmin’ scrummy. The most popular flavour from Salcombe Dairy Ice-cream is honeycomb although we are rather partial to stem ginger or mint choc chip. The smell on Fore Street in the morning is one dreams are made of. Drifting from The Bakehouse is the scent of freshly baked croissants which wafts into your nostrils. 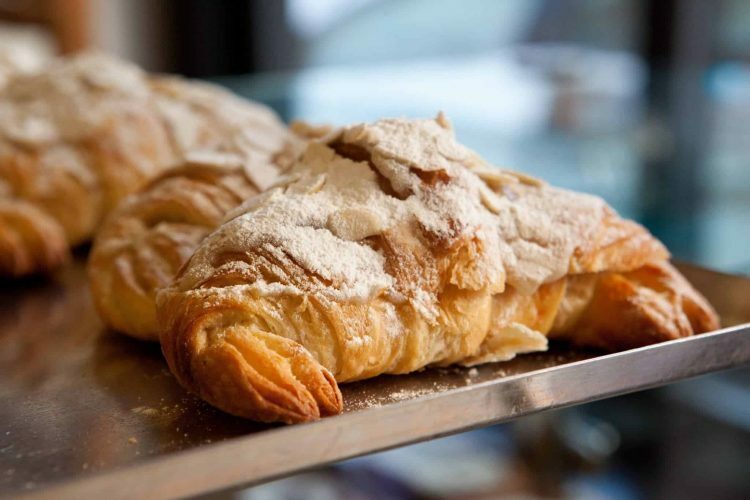 Like a hound getting the scent of a fox, you will not be able to resist; walk into that bakery and buy a few croissants – they are simply heavenly! If you can possibly resist the urge to eat them on the way home, slather them in a raspberry jam when you get to the breakfast table. Come on, you’re in Devon, why wouldn’t you have a cream tea? When in Rome and all that. Plenty of establishments in Salcombe offer the epic combination of tea, scone, thick local clotted cream and strawberry jam – a taste sensation! We love to go to the South Sands Hotel because usually the scones are warm plus their jam is homemade and particularly full of flavour…mmmm. We do however need to get serious about the order in which you put your cream and jam on. Devonians are strictly clotted cream first and then jam on top. Wo betide if you get the order wrong and go all Cornish on us..!